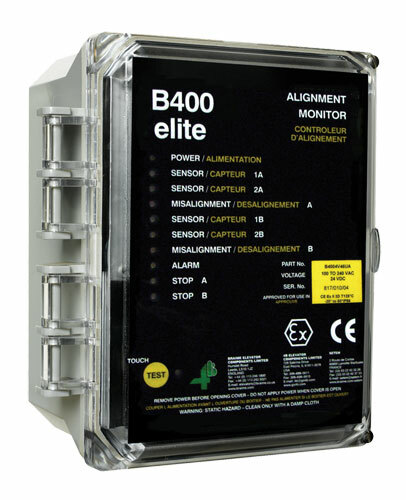 The B400 Elite Beltswitch belt misalignment monitor uses 4B Touchswitch sensors to monitor belt alignment in bucket elevators and conveyors. Each control unit incorporates two independent monitoring circuits for early detection of belt misalignment on one or two bucket elevators / conveyors. The 4B Touchswitch is an electro-mechanical limit switch with no moving parts. When a belt misaligns or a pulley moves over and contacts the sensor, the built in solid-state electronic circuitry detects the lateral force of the belt or pulley and activates a voltage free relay contact. Status LEDs on the control unit indicate the alignment condition of the belt, while internal relay contacts provide alarm and automatic shutdown of the elevator when hazardous misalignment conditions are detected.